$180,000 doesn’t seem like too steep a price after they lost every game in the SEC this year. It’s January 10, 2010, Auburn just kicked the field goal that iced the National Championship over the Oregon Ducks. The War Eagle faithful were already considering camping outside the local Wal-Mart to see the crystal football unveiled to the public (that probably isn’t a lie, either). Now, flash forward to November 24, 2012. The Auburn fan just witnessed their in-state rival whip the living hell out of the Tigers 49-0. The season ends after having only won three games, one of them against Alabama A&M proving they aren’t the worst team in Alabama. And War Damn Eagle is missing Cam Newton now. These are their key wins because these were their only wins. They blew out NMSU and AAMU, while ULM took them to overtime. By the transitive property of college football, though, Auburn beat ULM and ULM beat Arkansas so it wasn’t such a bad season…right? Those were all their losses. Note, they didn’t win in the SEC. I don’t need to find a cute, internet meme to portray Arkansas’ angst. Poor Arkansas, they didn’t even see it coming. They went from an 11-2 season, finishing the season in the top five, and a win in the Cotton Bowl over a pretty good Kansas State to their coach getting fired after a stereotypical affair scandal and proceeding to go 4-8 (2-6). 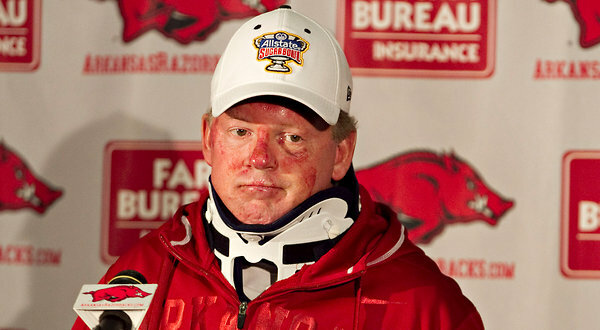 Hopefully next year is good for them with Bret Bielema coming to town. However this article isn’t about possibilities, it’s about what happened! Louisiana-Monroe was an SEC killer this year, topping Auburn and Arkansas. But ULM went on to have a mediocre season and got blown out by Ohio in their bowl, so I’d say there isn’t any consolation in losing to them. Rutgers is in the Big East. I don’t feel I have to elaborate on that. Also, continuing on the theme of “the SEC is seen as dominant simply because it’s the SEC,” Arkansas was rated #8 when they lost to ULM. Ole Miss’s biggest claim to fame is that Michael Oher chose to go to school there when Sandra Bullock essentially coerced him, narrowly dodging a Reggie Bush/USC moment. They also had the second best Manning quarterback their team, but he only was able to lead them to a Cotton Bowl victory. This year wasn’t quite a Cotton Bowl victory type of year for them. They went 6-6 (3-5) and they will play Pittsburgh in the BBVA Compass Bowl. Mississippi State was the only team they beat that was better than Mississippi. Also having state supremacy is nice even if your season record was worse. Another reason MSU is the only key win for them is because their other wins are Central Arkansas, UTEP, Tulane, Auburn (who went winless in the SEC), and Arkansas (who only beat Auburn and Kentucky). Not exactly a banner rap sheet. Seriously though who loses to Vanderbilt? They didn’t have any reality-breaking losses, but they lost to then #14 Texas 66-31. That’s pretty bad. They had three turnovers and let Texas run up 676 yards. Texas was pretty good this year, but 676 yards good? Doubtful. Mississippi State, though, had a pretty decent season. They went 8-4 (4-4) and lost to some pretty respectable teams. However, they did lose to Ole Miss. Not only did they lose to the in-state rival, that loss allowed Ole Miss to become bowl eligible. That is unfortunate for two reasons, their biggest rival was able to extend their season at their demise and they lost to a then 5-6 team 41-24. Ouch. They were able to stagger into bowl season by playing Northwestern in a New Year’s Bowl…the Taxslayer.com Gator Bowl (the ridiculous bowl names may be a subject for a later post). Not only has Northwestern had near-unprecedented misfortune in the postseason, they are in the Big 10. SEC teams can’t lose to the Big 10, it just doesn’t happen (see: Ohio State). They did lose, though. They lost by 14 points in a game that wasn’t close after halftime. A bitter end to the season for both Mississippi State and the SEC. MSU actually did not beat many impressive teams. All of their wins came against the bottom feeder SEC teams and some of the saddest out-of-conference teams one could possibly fit into a schedule. I gave them Arkansas because they won handily, 45-14. I already ripped MSU for losing to Ole Miss and NW. Saying anymore would be beating a dead horse. I’m not going to try to knock TAMU this season. Their two losses came against Florida and LSU which is nothing to sneeze at. Not to mention they absolutely rocked Oklahoma in the Cotton Bowl proving that their move to the SEC was warranted. I’m sure LSU fans felt this way after the Chick-fil-a Bowl. Louisiana State had a pretty good year this year. They went 10-2 (6-2) in the regular season and only lost to Florida and Bama who were exceptionally dominant this year. 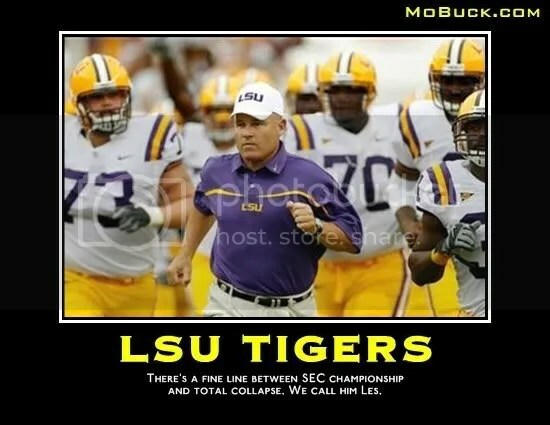 LSU had an anemic performance with previously mentioned cellar dweller Auburn, but a win is a win. LSU was on the short end of the two-team rule for BCS games, so they had to settle for the Chick-fil-a Bowl on New Year’s Eve against Clemson. Needless to say, the LSU Tigers were favored over Clemson. Surprisingly, Clemson kept it very close until the very end winning on a time-expiring field goal declaring to the country who owned the Tiger mascot. It didn’t help that Les Miles threw twice on 2nd & 2 late in the game, forcing a punt to Clemson for their game-winning drive. Needless to say, this was a huge blow to the acclaimed SEC dominance over the world, even if it was to a fairly talented Clemson team. Texas A&M and South Carolina were very good this year. However, TAMU didn’t come on until late and South Carolina wasn’t feeding Lattimore the ball this game only garnering 13 carries (the QB Shaw had 12 carries himself). Losing to Florida and Alabama is not a bad thing. Losing to an ACC team that has consistent bowl performance issues? Kind of a bad thing. Nothing cute here. Alabama is really, really good. They did play host to the most boring two game series college football has ever seen last year with LSU, but I guess that’s all I have issue with. If they lose to Notre Dame, though, it’ll surely be the nail in the coffin of the SEC’s *perceived* dominance. The series will pick up with the third and final segment on the SEC as a whole.